Food prices have risen dramatically this past year as higher commodity and energy prices are passed downstream to consumers shopping at supermarkets and eating out at restaurants. Overall, food prices rose nearly 5 percent in 2007, according to the U.S. Department of Agriculture. That means a pound of coffee, on average, cost 57 cents more at year's end than in 2006. A 12-ounce can of frozen, concentrated orange juice now averages $2.53 — a 67-cent increase in just two years. And a carton of grade A, large eggs will set you back $2.17. That's an increase of nearly $1 since February, 2006. Internationally, there have even been food riots in countries like India, Burkina Faso, Mexico, and Pakistan. Given the crisis in world food prices, you can expect to see higher prices at your favorite restaurants, but you can still find creative ways online to cut your dining bill down to size. For instance, DinnerBroker lets you book reservations at local restaurants and earn points for dining out, which you can then redeem for gift certificates. They even offer special discount reservations that give you a 10% to 30% discount if you're willing to eat during off-peak hours. 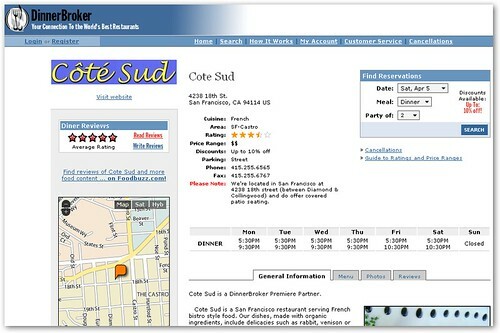 For example, you can get an (unspecified) discount on food and non-alcoholic beverages at Chez TJ, one of a select few restaurants in the San Francisco Bay Area to receive two prestigious Michelin stars, by booking through DinnerBroker. Another option is OpenTable, which lets you earn points for every reservation you make with every 100 points equivalent to $1 towards a gift certificate. 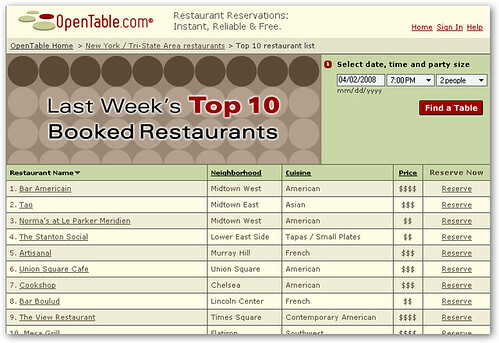 However, although OpenTable has a larger selection of restaurant partners than DinnerBroker, it doesn't offer the immediate gratification of discount reservations. On the other hand, you earn 1000 bonus points when you make a reservation at selected restaurants during qualifying hours. You can find other useful savings suggestions at SmartMoney.